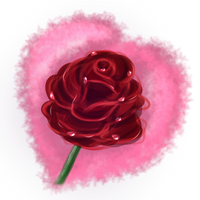 The study was pretty fun to do though the shading for a rose is pretty difficult. Can I not use this on a notebook? I want to use it on a sketchbook. Thanks for the tutorial though. B.D likes roses. It might be help! This is awesome!PS:I'm guessing you use Photoshop? Thank you that is super helpful!! This looks amazing and very easy to understand! Thank you! Outstanding tutorial - both informative and interesting. Thank you for your part in making me a better artist! wow, thanks for the tutorial, i'd like it. Beautiful. Makes me think of the Virgin Mary and how a rose drops by her feet every time a man or woman prays the Rosary. this is very helpful, and its beautiful! This is a really good one here!! Very nice tutorial! Very simple and unique! Looks like a good tutorial! Can't wait to try it! Wow, thanks! I've always had a hard time drawing roses, but you've given a pretty helpful guide for how to approach it! This is wonderful! Thankyou for the tutorial. Can you maybe do one like this at a different perspective at some point? Like as if it were tucked behind the ear! But regardless this is absolutely beautiful! !